Hi, friends! Here is a new sheet of labels (Word version here) with a box for the customer's total amount due. Great to attach to the cookie boxes to make payment upon delivery a little easier! If they've already paid, just write PAID in the box. I went with the owl theme to change it up!!! ;) Enjoy! Designed by me. For your personal or troop use only. Professional printing okay. 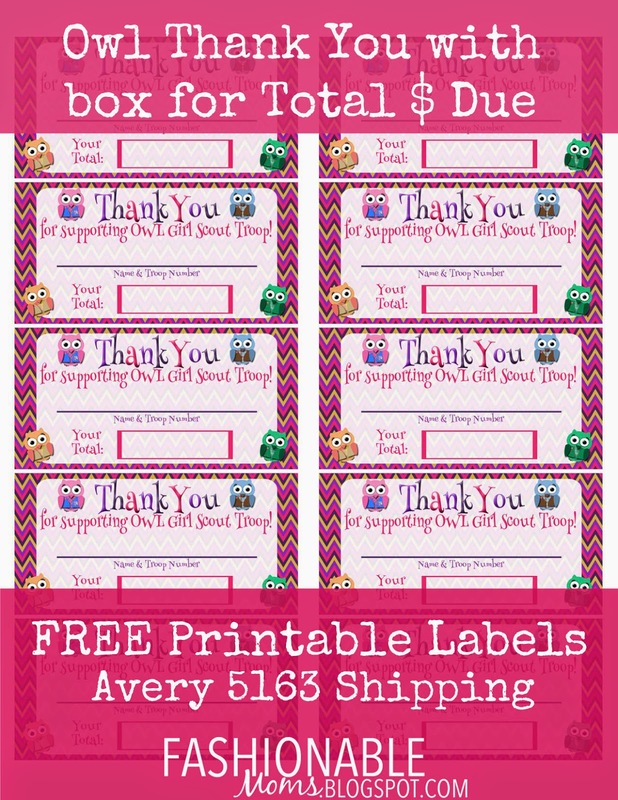 Hi I LOVE all your printables for girl scouts. It gives boxes an extra personal touch. With that being said I've been trying to print the OWL thank you's & the GS thank you's. I purchased Avery 5163 labels but when they print they are slightly off from the top, any suggestions??? I even have a new printer.Any help would be greatly appreciated!! Thank You!! Oh, I'm so sorry they were not lining up!! Try the Word version: https://drive.google.com/file/d/0B-BnXMbOyHAtOGotLUREdEVfYUU/view?usp=sharing. I know I get frustrated with labels a lot, and printers are all so different! Hopefully the Word format works for you! !